As is tradition for BYU’s football program under the tutelage of Bronco Mendenhall a fireside was held tonight in South Bend before BYU’s game tomorrow with Notre Dame. Among those in attendance was Rudy Ruettiger, the legendary figure behind the classic movie “Rudy.” I would write a summary of what the movie is about, but if you haven’t seen “Rudy” then you probably aren’t the type of person who would be reading a sports blog anyway. Rudy: Father, I have something to tell you and it can’t wait until later! Priest: By all means, my child, come in. Confess your sins before me and they shall be remembered no more. Rudy: No, it’s not like that, Father. Priest: Oh. I should have known, Rudy. It must be about the football team. (sighs) Ok, go on with it then. Rudy: I don’t think that BYU is going to show up to the game tomorrow. Priest: Really? What makes you say that? Rudy: Well, I’ve just been to their pre-game mass. It was an odd meeting, and that’s saying something! It seems like they are getting ready for a funeral tomorrow, not a football game. Priest: I see. Well, run along now and I’ll inform the coach. Rudy: Ok. Thank you Father! Priest: Oh, and Rudy. Just don’t pray about their book. That’s how they get you! Since we know that the fireside was not, in fact a preparation for a funeral and that BYU will in fact take the field, here’s a quick preview of what to actually expect tomorrow from the Irish. On offense the Irish are lead by senior quarterback Tommy Rees, who averages just under 250 ypg passing. The double headed rushing monster of Theo Riddick and Cierre Wood has moved on and so has the Irish run game, as the Irish leading rushers have just 512 and 486 yards rushing on the season. But the Irish have put up more points than a season ago, averaging nearly 28 points per game. The offense will likely need more than that to come out of Notre Dame Stadium victorious on Saturday. 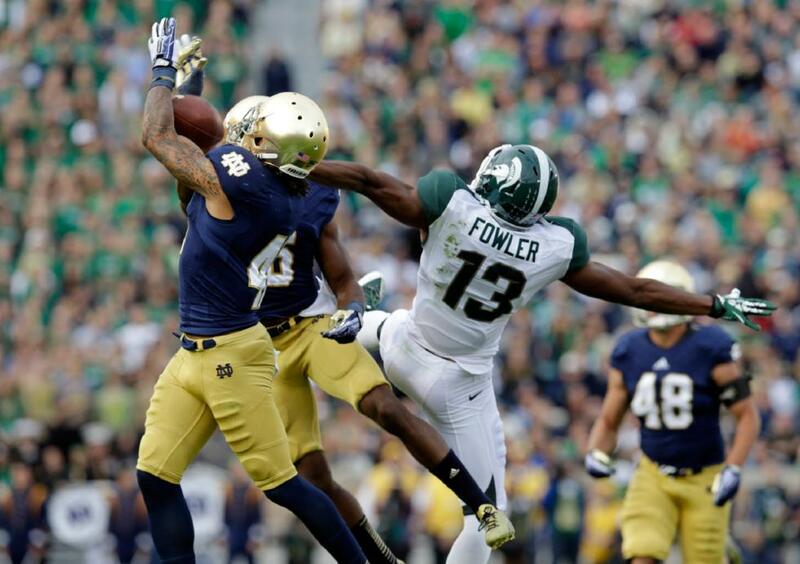 Matthias Farley (the extremely tattooed at left) makes an interception against MSU. The Notre Dame defense has played a number of mobile quarterbacks this year, but none quite as talented as Taysom Hill. ND cornerback KeiVarae Russell spoke of Hill saying “This guy is like Denard Robinson (former Michigan running quarterback extraordinaire). He’s like a running back at quarterback.” Even without star lineman Louis Nix III, a strong defensive line, led by Stephon Tuitt (5 sacks, 35 total tackles), should be able to take advantage of BYU’s weak offensive line and put pressure on Hill. Linebackers Carlo Calabrese, Dan Fox, and Jackson Bennett lead the Irish in tackles while Matthias Farley leads an Irish secondary that has only registered six interceptions on the year. I said in my mid season report that BYU would win at Wisconsin or at Notre Dame, but not both. A loss at Wisconsin two weeks ago means that BYU is prime for a victory tomorrow. Don’t expect a low scoring 17-14 affair like last year (even though we would have won if Riley didn’t throw the ball 20 yards over Hoffman’s head). I predict that Taysom will throw for 250+ and run for 100 more as BYU rolls by 9.